IN April 1966 the Star reported on a young Lisburn man who had set up a broadcasting station on the jungle covered island of Lahuan about five miles off the northern coast of Borneo. John Derrick Sayers (26) from Delacherois Avenue in the town, was among a group of British airmen who worked five days a week at the station. Their broadcasts included recorded serials and the English Football League results and it provided entertainment for around 4,000 people. John, a Corporal, was also a dog handler. He appeared twice at the Royal Tournament in 1962 and 1963. IN February 1958 the Lisburn Industrial Development Association was formed in a bid to bring new industry to Lisburn and the surrounding area. The remit was also to try and retain existing concerns facing closure and they were soon in London to meet with the Minister of Supply over the threatened closure of Altona. The new Association was formed with representatives from three different groups including the Lisburn Urban and Rural Council, the Hillsborough Rural Council and Trade Union members who would look after the interests of the workers. 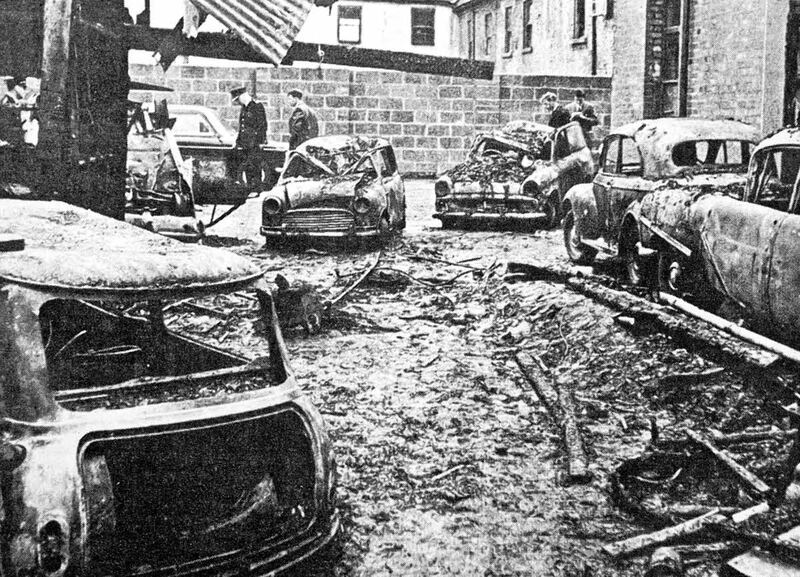 The devastating scene at the garage of local car dealer John Hamilton after an overnight fire ravaged his fleet of motors in 1966. 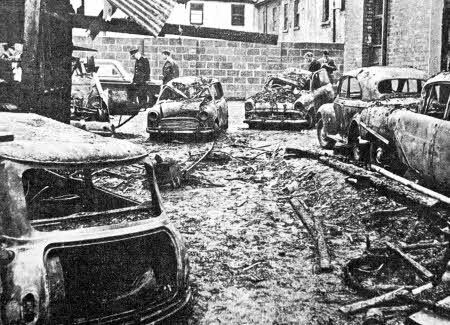 THE state of Drumbo village was in the spotlight in The Ulster Star in March, 1969. The front page story reported retired blacksmith David Titterington, a member of Hillsborough Rural Council, lashing out at the state of the village. He was quoted as saying: It is a shame and disgrace and reflect no credit at all on the council. They talk about entering best kept village competitions. I only wish there was a prize for the worst because Drumbo would walk it." A member of the Council for 15 years, Mr Titterington added "There are footpath potholes people could be drowned in and what about the broken windows and broken down fences?" His attack came following a decision by the Council to enter Hillsborough, Saintfield, Dromara and Edenderry in the Central Gardens Association's Best Kept Village competition and Carryduff for the best small towns competition. "I have nothing against these villages entering the competition; and good luck to them, but I think the Council should make a greater effort to keep Drumbo tidier. "And if the tenants are to blame or fall down in any way then it 6 up to the Council to take whatever action it thinks." 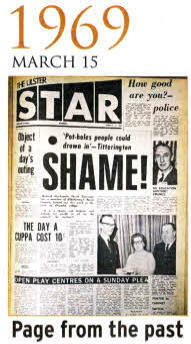 THERE was bad news for local residents in March, 1966 when The Star reported an increase in rates. A rate of 29/- (£1.45) in the pound for the new financial year beginning on April 1, 1966 was struck at a special meeting of Lisburn Borough Council - an increase of 1/8 (8p) on the existing figure. The town rate was unchanged from 14/10 (74p), but the poor rate went up from 12/6 (62p) to 14/2 (71p). Councillor Hugh Bass, who proposed the new rate as recommended by the Finance Committee which met before the full meeting of the council, said that the town rate, which dealt with local services, was the same, but the poor rate, relating to county services, was up by 1/8. The Antrim County Council's demand, at £163,710 was an increase of a whopping28 per cent. Councillor Bass added that they had 'scraped the barrel, and had to use up credit balances to keep the town rate the same and they had no money left for further economies. 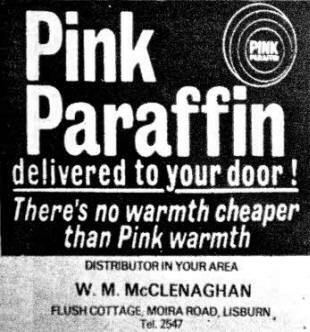 IF you were running low on fuel for your heater then you would have warmed to this advert from the Star back in 1972. He also described the rating system as unjust and said that he hoped the Government and County Council would look into the matter. Alderman Arthur Bowman, who seconded Councillor Bass's proposal, said he endorsed everything Councillor Bass had said. Alderman James Howard, the Mayor, who presided, said he personally was delighted to see that the town rate was unchanged and that it was lower than it was five to seven years previous. He added that this was a good sign for prospective industrialists coming to the town. The Mayor said that the County demand was an ever increasing one and that the rate would have been much higher had it not been for Mr Robert C Newell, the town clerk. The past week had been an anxious one for Mr Newell but he came through what was a very hard task. THERE was good news for boxing fans in August, 1985 when Lisburn's Damien Denny was ranked the best amateur light welterweight in Britain. The 19-year-old Irish Champion was top of the rankings released by the Amateur Boxing Association. Denny, from Ballynockan Park, boxed at the European Championships in Budapest and was a member of the Holy Trinity Club in Belfast. THERE was recognition at last for Lisnagarvey hockey player Mike Bowden in 1969. After a sensational trial at Londonbridge Road the Lisburn man was called into the Irish team at inside right for his first international cap. Bowden, although picked out of position in the trial game, mesmerised his opposite partner international David Judge. At 26 years of age, Mike, a PE teacher at Ballygomartin Secondary School, was no newcomer to the game. It was just strange how he failed to catch the eye of the selectors for so long. Mike was poised to earn his first cap against Wales.